Located in the Upper Tauern National Park in Salzburg, in the Pinzgau, the water rushes down 380m in amazing cataracts, forming the highest waterfall in Austria. The waterfall is spread over three levels, with wonderful spray, rushing water vortices and as well very quiet coves. In the summer surrounded by verdant land, surrounded by dark fir trees, bare rocks, driftwood and rainbows, these waterfalls are a natural spectacle for adults and children. And, as scientifically proved: a relief for asthma sufferers. More about this below. The quantity of water of the glacier stream varies, even during the day, generally there is less water in winter, which might freezes and sometimes form bizarre ice sculptures. In the summer, especially in july and august, there are the largest water masses to admire when thundering to the valley. The waterfall is located is near the town of Krimml, on the western outskirts of Salzburg, directly adjacent to the Tyrol and not far from Italy or East Tyrol. Krimml is about 1.000 meter above sea level. The middle station of the waterfalls is at 1.330 meter altitude. The path runs along the waterfall in hairpin bends and offers several stations at which the waterfall, the beautiful view, the drizzle, but also small refreshing showers can be enjoyed. The path itself is for good hikers to walk in 30min. Families should calculate with one hour at least with all the waterfall-viewing. The path winds up in the forest, pleasantly shady and only short pieces are in the hot steaming Alpine summer sun. Although the air is pleasantly moist, the way in sunny weather but dry and with sneakers or shoes easily doable. Pushchairs have already been sighted on the way, it is not recommended as the narrow road is soemtime very steep, and not all areas substantiated. With small children you can visit the lower area where the waterfall lands in its riverbed, and get your natural spa experience, enjoying the positive impact on the lungs of the spray. The upper waterfall is in one hour walk away. 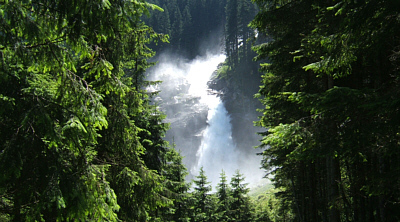 For experienced hikers: from the upper waterfall there are several routes into the Krimmler Achental. 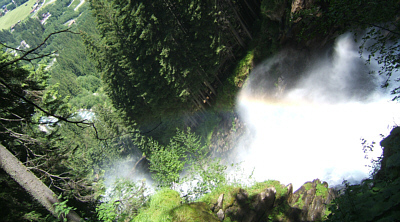 The Krimml Falls also have a European diploma, first time awarded 1967, it should protect the waterfall as a natural monument. For people with asthma or allergie a to stay at the waterfall is in all cases hilghly recommended. 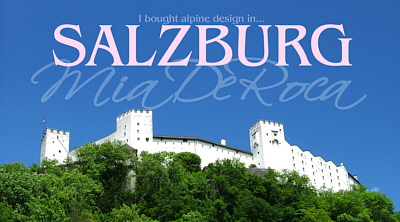 During thelast few years several studies have been conducted by the Medical University Paracelsus of Salzburg. A study in 2007 showed that children, who spent an hour daily at the waterfal for three weeks, experienced spontaneous improvement of lung function. Even four months after the therapy positive impact and reduction of asthma symptoms were measured. Sources of the improvement are electrically charged water particles that have a cleaning and stimulating effect on lungs. But even without the medical value: the walk is beautiful, even on hot summer days pleasant and periodic cooling at the viewing points, the good air and high humidity are very savoury. The parking lot directly at the entrance is free. Meals are around the entrance, at the middle station of the waterfall and the upper waterfall. For all those who leave power, there is a taxi service.